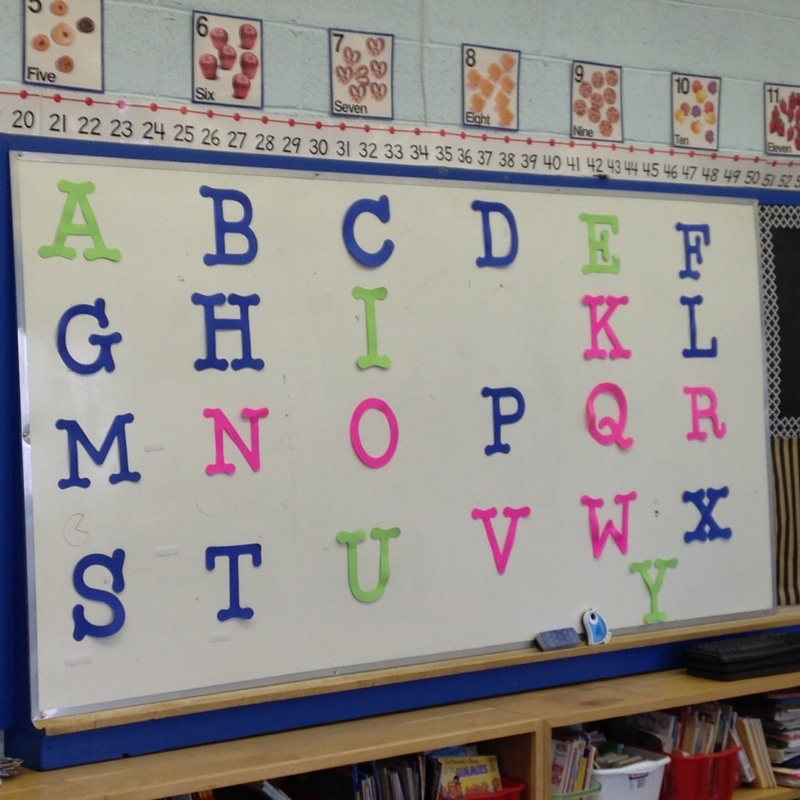 Mrs. Mouland's Mash-Up - What's Happening in My Room? 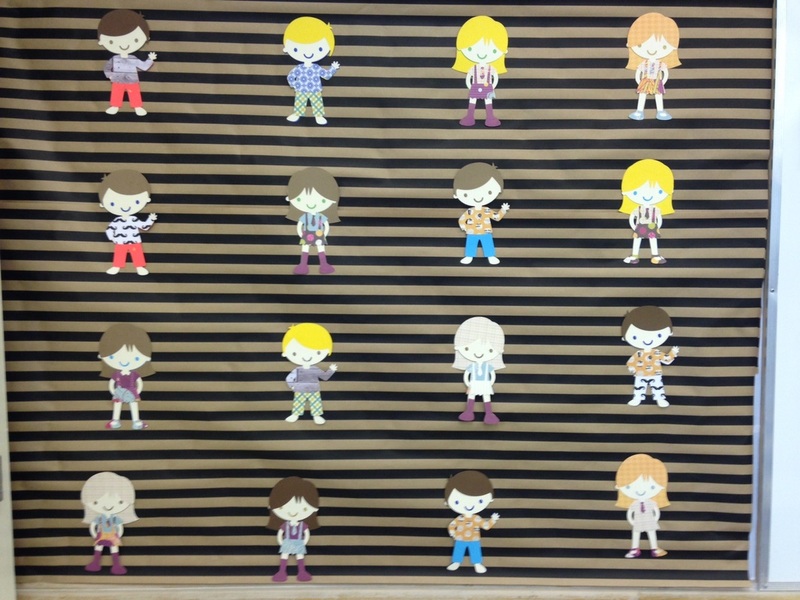 I've been waiting forever to bust out the Cricut and make an awesome Halloween bulletin board with my students. I can't promise I will always have this level of energy but I can promise I will try. 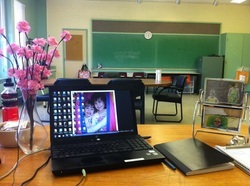 When you flip up the little ghosts you'll see pictures of my adorable students. There are also a few bonus pictures below. I bet the people you work with all day aren't half as cute as these guys. 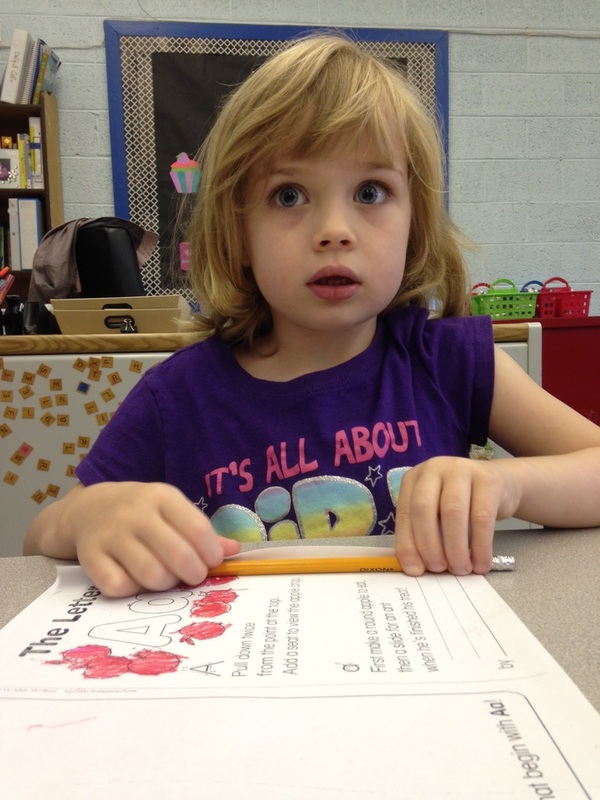 Kindergarten is going well. We are finding our rhythm and we are pretty sure we are the best class in the whole entire universe. More updates soon. School Starts Soon and I'm Not Ready! It's really only days away and my classroom is NOT ready. But, that's okay! I think my Kindergarteners would want to be involved in the classroom decorating process, don't you? If you're one of my students parents, Welcome! You can come back here on occasion to check in and see what we are doing. I'd like to promise I will update regularly but we all know that's not true. I will, however, do my best. I am really excited to meet your little ones. I have so many ideas that I can't wait to start with them. I really think this is going to be a great year. I will send home a newsletter during the first week of school. This will give you some details on our class and offer a form to sign that will allow (or not) your child to appear here on our blog. It's completely up to you, and every child will be included in all our fun, regardless. So, if you're nervous about your little one starting Kindergarten this year, relax, because not only do I have a little one starting this year myself, I am also starting in Kindergarten and pretty anxious myself! At least we are all in this together. Empty white boards are so boring. I added a little village to make it more interesting. 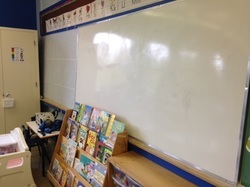 More plain white boards. Yuck. 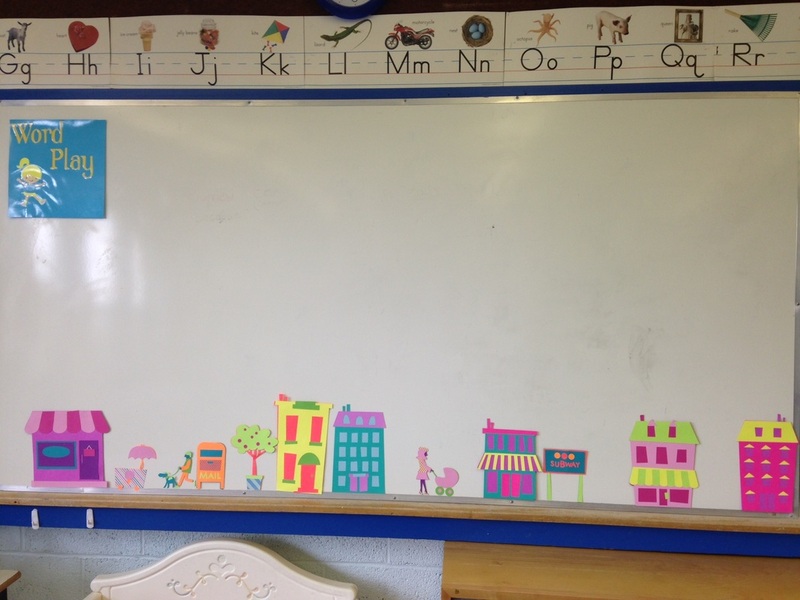 I added some fancy wrapping paper to this small board so I could add a little cut out character for each of my students. Aren't they cute? I think I will add a little bucket beside each one and when they do something kind they will get a sticker on their bucket. We are Bucket Fillers at our school! 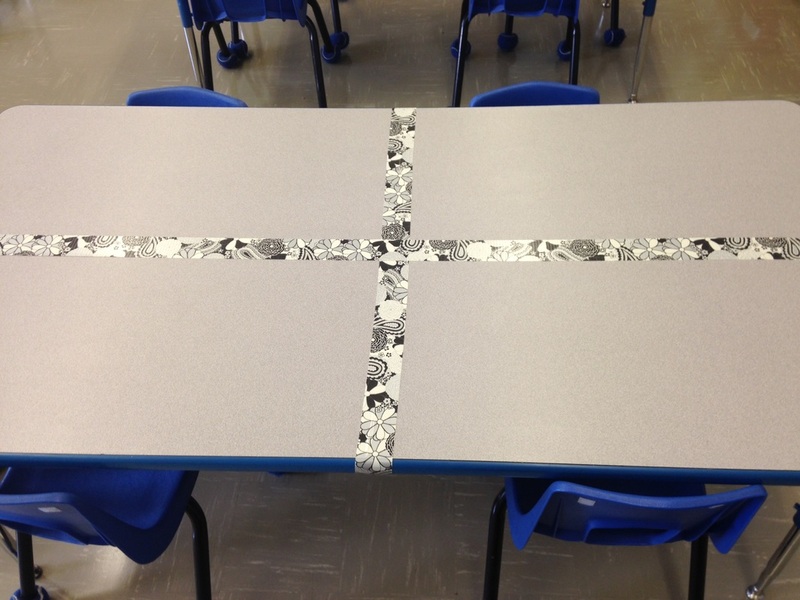 A little fancy duct tape dressed up the table and gives kids their own space. I'm currently in love with fadeless black paper. Don't tell my husband how much it costs because I have stocked up! This bulletin board is all mine! That's why I added the lattes and comfy chair. Teacher stuff can go here. Not sure what I'll do with this under the sea board yet but maybe the kids can help me with that. Of course, Oakley came in to help me prepare my classroom. I know, I know. It's barely July and I am thinking about school. I blame the Cricut. I'm not getting paid to mention them, by the way, but I strongly feel I should be. Anyway, this is how I have been spending my rare moments alone. At the very least, my classroom is going to look good. I'll try to add a little substance to the style when the time comes but for now I am totally focused on decor. (I know some of the images are upside down but I have more cricuting to do, so I don't have time to fix them. Me! It's been a long time since I've been in the classroom and although I enjoyed my time as a specialist, any teacher will tell you that having your own classroom is where it's at. So, to prepare I have been scouring Pinterest, and spending money I don't have, of course. I guess the only thing I know for sure is that if I have any little 'Kates' in my classroom I will do my best to help them navigate this strange world, and it's very likely I'll have a few and I can't wait. Until then, I will continue to prepare a most inclusive classroom and when the times comes I hope they'll let me share it with you. I know some of you do not have the luxury of a classroom all to yourselves. Some of you work in a closet or a corner or a stairwell. (Don't laugh, it is painfully true). I am sharing my room because I do have that luxury and I don't want to waste it. So to begin, here is my "Sensory Space". I will be adding some mats to the walls and eventually there will be a sensory loft built here. Lofty goal, I know (pun intended) but I will get it done. I will raise the money if I have to. I would build it myself but the safety of the children is too important for me to risk. For now, when students visit my room they can grab a book and chill or get some squeezes or a belly roll from their EA or myself. Sometimes we just build a fort out of the soft furniture and find some comfort being squeezed into the corner. If you don't think that is a perfectly legitimate form of therapy then you've never tried it. Next, I have a boardroom table for all the other 'stuff'. The hard stuff. The stuff that makes parents angry or sad and sometimes even happy. The stuff that we must do so that we can get to the stuff we want to do. The legal paperwork that promises I will do whatever it takes to help their child have success. I hope they know the paperwork does not compel me to do this. I do it because I love it. The paperwork is a necessary evil. Recently, we purchased three hokki chairs. These things are great for those children (or adults) who just cannot sit still! I have yet to deliver these two to students that I think may benefit because the staff have all been giving them a try. We used to use exercise balls but after so many pencil punctures we decided to go for something a little sturdier. Yes, I have a Wii. Yes, the kids love me more now. Although, the merits of screen time can be debated at length, we felt that a little full body sensory workout goes a long way for some kids. For example, I just watched five kindergarteners attempt to coordinate their little limbs to play Just Dance. They went back to class happy and refreshed and I am still smiling at how unbearably cute that was. Of course I have a desk and a file cabinet and all the stuff I need to manage the mountains of paperwork. I try and keep it organized but I totally staged this photo so it would look better than it usually does. Behind my desk is the bulletin board I use to decorate for the seasons. I also have a Cricut paper cutting machine. So, I have a small addiction to cutting paper and sticking the designs up all over the school. I could spend hours watching that thing cut. Finally, I recently added a mural to my closet doors because they were plain and boring. I used the cover of Oliver Jeffer's, "How to Catch a Star" because it is my favorite book. I am hoping to add a few more murals around the room but I will need permission first. So, there it is. My workspace. I would love to see yours. It's book order day! I think, like any teacher, I am more excited than the kids when that brown box lands on my desk. I don't have a homeroom so I only order for myself and I think it is fair to say I spend a good chunk of money on books. I rationalize it easily because I use books to teach every skill and concept imaginable. I am pretty sure we all do. Today, I opened up these gems. If you follow me over at GoTeamKate then you know who that Teenage Mutant Ninja Turtle Book is for. And, that glitzy owl notebook is going straight home to Grace but the others will all stay at school for my students. I can't wait to dig in. I found two books in this order that I must tell you about. They are my two very favorite books of the Fall. (I even ordered a few extras for Grace's classroom so let's hope her teachers share my sense of humor). The first book, and my favorite by far, is called, "Ode to Underwear", written by Helaine Becker and illustrated by Mike Boldt. For the primary crowd this book is genius. If you want a quiet read loud book, this isn't it. It is catchy and simple written and the illustrations will make you laugh out loud. Check out the author's website here. I wasn't able to find it for sale anywhere but scholastic but you may have better luck. The furry underwear with the sword made my day. Reading this with my students and laughing with them might be one of the best stress relievers I can think of. If you have children who are potty training this little poem might be a great tool to get them interested in wearing underwear. I can't not say enough about this book. The next book that will be a staple in my lesson plans this Fall is called, "Creepy Carrots." It is written by Aaron Reynolds and illustrated by Peter Brown. "Creepy Carrots" is a Caldecott Honor book and that accolade is well deserved. The illustrations are what originally drew me to this title and their old black and white film style adds to the creepy flavor of the story. Jasper, the bunny, experiences some serious paranoia when he starts seeing creepy carrots everywhere he goes. You might be surprised at how he decides to solve his problem. The students will love the suspense and will most likely ask for this one again and again. I think this book would be wonderful for a lesson continuing the story from where it ends: What did Jasper do next? Or older children could be asked to write a sequel or a prequel. Ther are so many possibilities. I just want you to know that I am not getting paid or receiving any perks to review these titles. I just truly adore them and I wanted to share them with you. I played with my children every single day. I painted and sculpted and gardened and baked with my children. I cooked and made meals for my family to eat together and with friends. I kept my house organized and clean and went to bed early almost every single night. I woke up to the sound of my girls calling, "Mama" rather than the sounds of an alarm. I traveled with my girls and my husband. I watched baseball. I swam. I shopped. I read books for fun. I hurt my foot and let my casted foot rest on the very footstool I tripped over in the first place while I watched copious amounts of daytime television. I had a wonderful summer. I was able to refresh. I don't regret one single second of it. I will just be the well-rested teacher ready to give the children what they need. So, your kids are home for the summer and you want to keep them busy? Why not kill two birds and choose one of these activities to help keep skills sharp. As any teacher will tell you there is typically a regression of skill over the summer months. Students work hard all year and they are entitled to their vacation but why not make summer activities functional and fun? Here are two simple examples and trust me when I say they are simple because I've got no time for complicated and time-consuming! 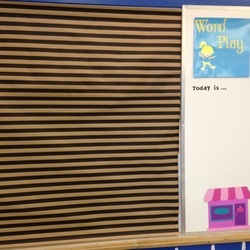 Try a little reader's theatre? If you children are able to read then you're all set. Choose a book and send them off to prepare to read the story as if on stage. Ideally, you'll choose a book with 'parts' like: "The Three Little Pigs" but anything will do. You can find reader's theatre scripts by clicking here. Recruit some of your kid's friends and they'll keep busy all afternoon perfecting their 'parts'. Ask one of them to video tape the performance. If you're unsure of what book to choose the book store does sell readers that are specific to reader's theatre. Remember: children DO NOT have to memorize anything. They should be reading from the book or script. The skills they are working on for this activity are fluency and group work skills. 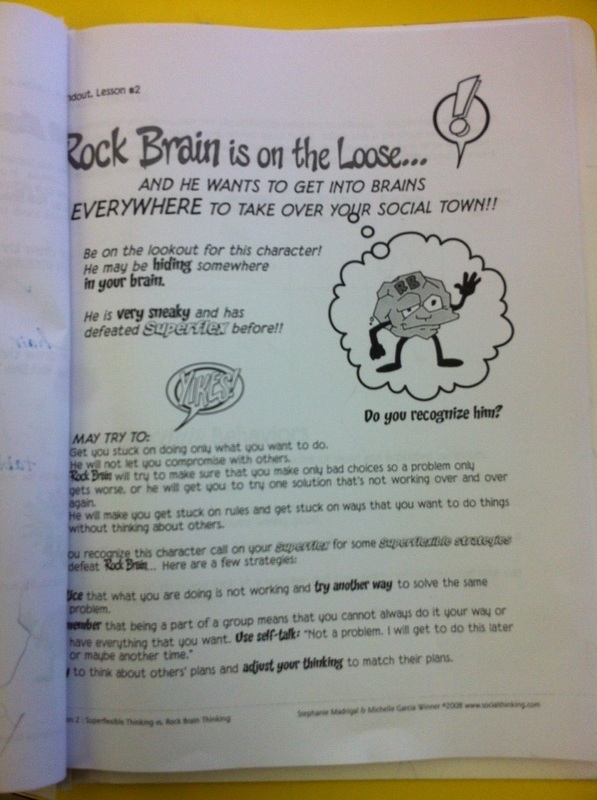 This is reading practice for purpose and children love it. If you're children do not read yet, like mine, or have cognitive delays or issues which prevent them from reading you can modify this activity. 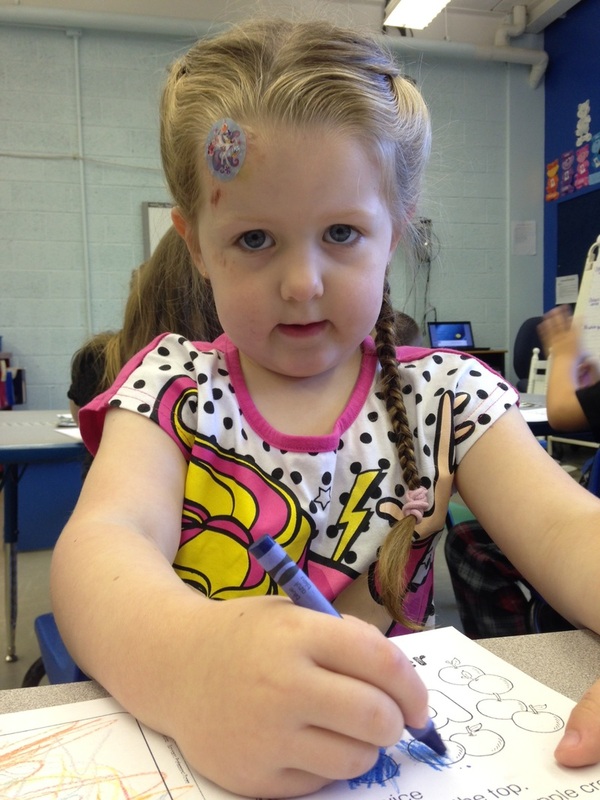 Children love books and they can "read" the pictures as mine do. Non-educators may not know that "reading the pictures" IS reading. It is the first step in becoming literate. If your child is non-verbal, encourage them to imitate a movement or an emotion they see on a page of the story. Always model what you wish them to do and encourage spontaneous communication about the book. Remember, communication does NOT always come in the form of words. During the school year I will often use a beautifully illustrated book to work on emotion recognition through reader's theatre or social skill practice with students who struggle verbally. BAKE! Choose an easy recipe. Kraft Canada has recipes for children 6 and under which I think are great for children of all ages. Baking covers so many topics and should be a part of the regular school day! Children will be practising the obvious things, like math and reading but they are also learning about procedural writing and nutrition. Baking can be easily modified for children of all abilities and the great thing about baking is there is a built in reward for all that hard work. Take some pictures while you work and ask your children to write out the recipe in their own words (or if the child is not ready for writing, or unable to write, ask them to place the pictures in order (sequencing). By the end of the summer you may be able to publish your own cookbook. Trust me, your child's teacher will thank you. 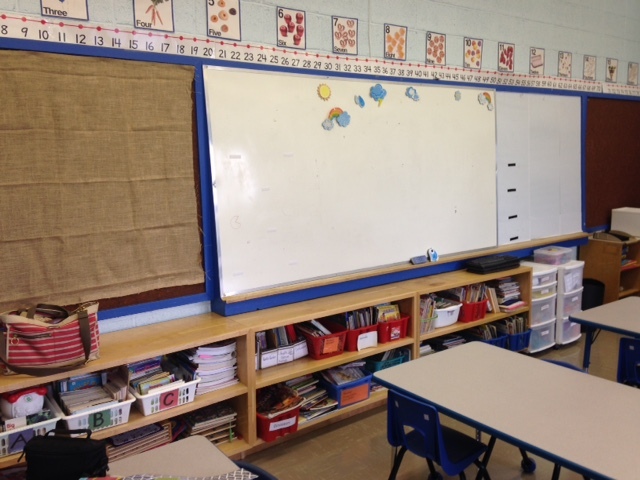 It is the end of the school year for us and as you can see my classroom is looking very bare as I clean it out for the summer. Teachers have mixed feelings this time of year. On one hand we can be worse than the kids with anticipation of our summer 'break'. On the other hand we have poured so much of our energy, time and heart into these kids that the thought of not seeing them for two months can be hard. Teachers call their students, "my kids" for a reason. They treat their students like 'their children'. Do you know that feeling of happy exhaustion you get when your children are tucked in at night? Yes, that! That is how we feel when we walk out of our school in June. I could spend this time reminding you that teachers are not paid for their summer "Vacation" (we are paid for the ten months we work and our wages are spread out through the summer months), or I could remind you that teachers work nights and weekends and summers to prepare for 'their kids' success. But, instead I will just remind you that teachers adore your children and they will miss them this summer while they drink lemonade on their decks ;). 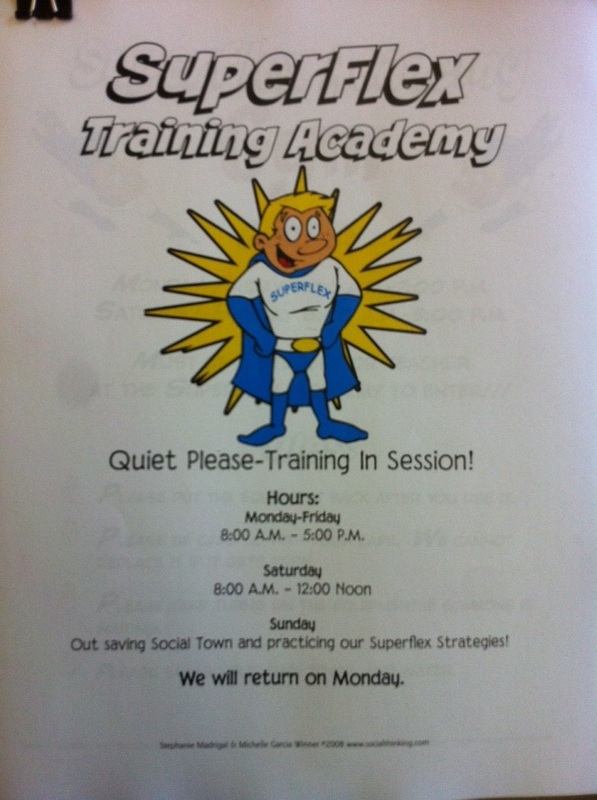 For the past couple of weeks I have started the SuperFlex program with some of the students I work with. 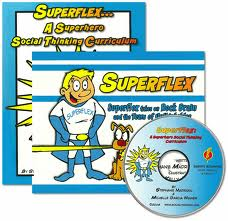 Superflex is a social thinking curriculum that allows teachers to deliver the concepts of social thinking and socially accepted behaviors in a way that kids will understand. The hero "SuperFlex" must defeat the "unthinkables" which try and prevent him from doing the 'socially acceptable" thing. Yes, many of the things we consider socially acceptable are difficult for any child but trust me when I say these characters are pretty spot on and they do not target behaviors that might be natural to a child with autism such as hand-flapping or rocking. This program genuinely targets behaviors that might get in the way of our students' success. I won't share pictures of the group for obvious reasons but below are some of the resources I am using. I selected a group of five boys from the K-2 group with varying degrees of dysfunction in terms of social interaction. Superflex is far better suited for the older kids (grades 3-5) but I am adapting and modifying the curriculum where needed. (Don't we do that everyday with everything anyway?) Anyway, these kids are doing great and we reguarly destroy the "unthinkables", like Rock Brain (Rock Brain is rule bound and ridgid and will only see things one way) and Topic Twister Meister (Topic Twister always twists the topic of conversation around to what he wants to talk about; eg. Thomas, Spiderman, My Little Pony, you're nodding your head.) 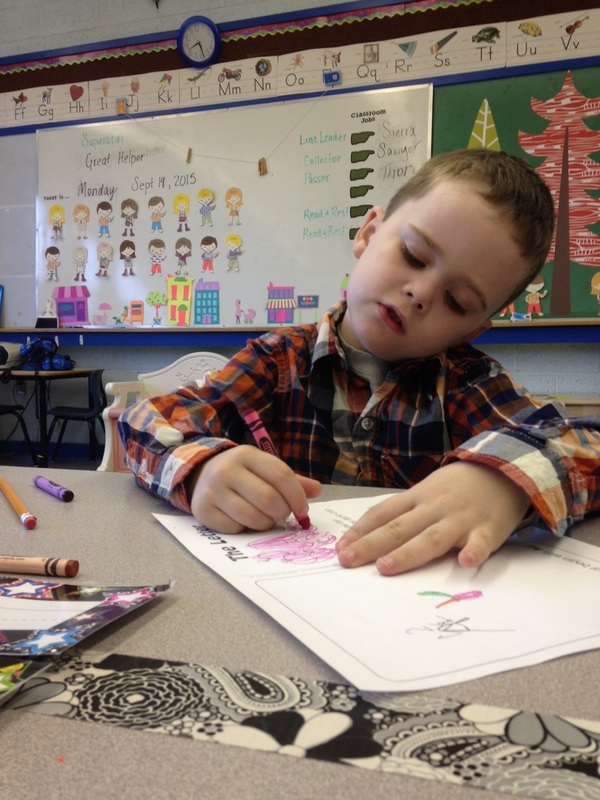 This curriculum is especially effective for children on the higher functioning end of the autism spectrum . It is set out nicely and it is very easy to use. I am pleasantly surpised at how the students learn that these behaviors DO NOT define them but sometimes get in the way as the students try to navigate through the day. I tweak it a little here and there for personal reasons and philiopshies and you can too. The sign for my classroom door. 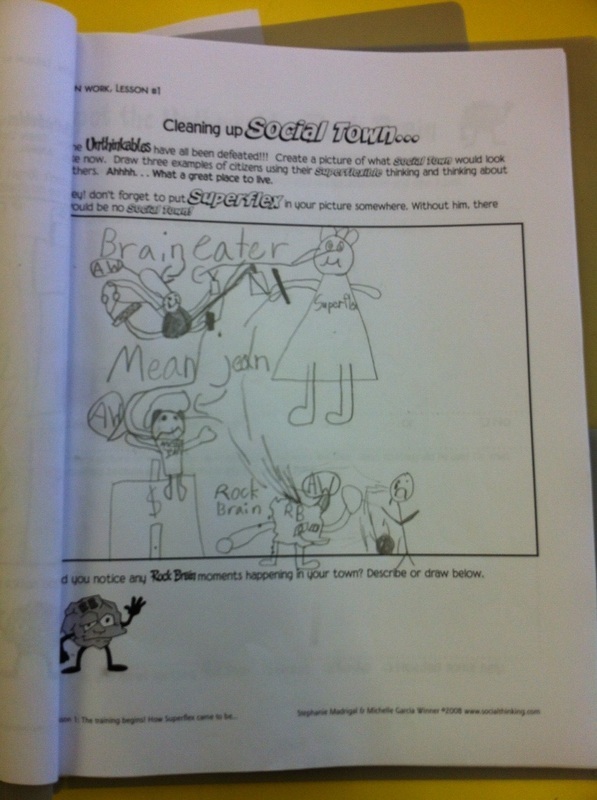 One students depiction of himself defeating Rock Brain. 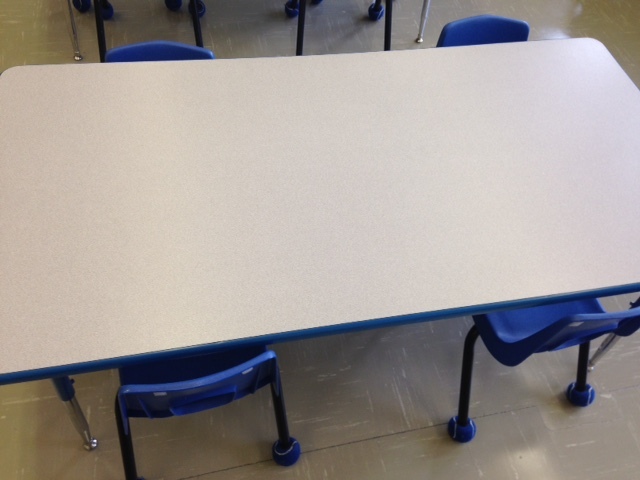 This is a my yellow table, where I deliver some of the program. We do not stay seated long and the paperwork is less important than the conversation and activity but for privacy reasons I cannot show you the role play the students will engage in in order to understand a particular concept. The dolls you see, (Virginia, Vincent, Edgar and Albert, you might recognize them) are dolls I use to help with the role playing when a child might be a little confused about the concepts. I think it is fitting that these dolls represent people that most certainly exhibited characteristics of autism spectrum disorder themselves. I use these dolls a lot in my teaching. I find many of my students, regarless of age or issue, relate to these guys and can often verbalize more to the dolls than they can to me. I highly reccomend you invest in some dolls that are age appropriate for the dignity of your students. I found these in a shop in St. Andrews, NB. I would love to get the rest some day. And while we are on the topic, below is a program I would love to buy someday too. It is no wonder teachers are broke! Check out Friend 2 Friend: The Demystification of Autism Program by clicking the picture below.